2000 W. The drum heater is equipped with light indicator, 30 – 110°C thermostat and 165°C thermocut. Other thermostats and thermocuts may be used, but these are not standard items. 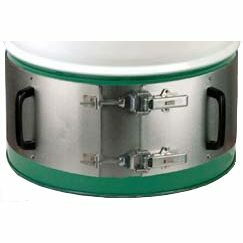 The drum heater is supplied with 3 metre cable with plug and must be connected to earth. The drum heater is mounted on the lowest third of the drum thus the heat rises up through the content. To ensure optimal heat transmission the heater must be adjusted after first heating and must then adjusted regularly (the use of gloves must be necessary due to the heat). Do not use the drum heater outdoors, in wet rooms and overflow of liquids must be avoided. Heating must not take place if the heater is not placed on a drum. Drum heaters are equipped with an overheating fuse which disconnects the element at high temperatures caused by thermostat defects or problems with heat transmission to the drum. Please check if the heater is correctly mounted onto the drum. The overheating fuse is reconnected by pressing the button below the red nut on the connection box -after cooling down the drum heater. Any repairs must be made by an authorised electrician. The drum heater will get hot during operation. The drum heater must be placed min. 1 metre from inflammable materials. The drum must be placed at a well-ventilated location. To adjust the thermostat remove the safety plugs on the side of the terminal box and the thermostat can be adjusted with a screwdriver. The indicated temperature is the surface temperature of the heater and not the liquid temperature.